The radio frequency spectrum is a naturally limited resource of extraordinary value, as the key to the provision of important communication and information services. Traditionally, spectrum has been allocated first to specific access technologies, and then sub-allocated to specific access networks, on very long term basis (up to decades). The traditional scheme can be very inefficient when demand patterns (“loads”) exhibit high temporal and spatial variations. Dynamic spectrum allocation (DSA) improves radio spectrum efficiency by adjusting the allocation as demand changes in time and/or space. In previous work, we introduced a DSA scheme in which a spectrum manager periodically auctions short-term spectrum licenses. The scheme can be supported by a realistic “pooling” business model, and can work with many radio-access technologies. But our previous analysis only considers a code-division multiple access (CDMA) technology; and DSA provides the greatest benefits with the participation of networks having complementary “busy hours,” such as video entertainment services and cellular telephony. Here, a digital video broadcast (DVB) terrestrial network joins the scheme. A typical DVB terrestrial cell is (much) larger than a UMTS cell. This brings to the forefront inter-cell interference, and inter-related auctions in different cells. To capture the essence of these issues we focus first on a situation where one DVB terrestrial cell overlays two adjacent CDMA cells. Subsequently we discuss extensions to richer scenarios. 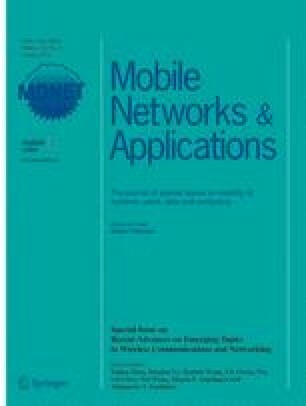 The contributions of the present work over our previous publications include to : (i) address the impact of inter-cell interference among several CDMA cells, (ii) introduce the DVB access technology into the DSA scheme, (iii) modify the auction scheme to consider that a DVB cell overlays several CDMA cells, (iv) characterise analytically the marketing and bidding behaviour of the DVB network. V. Rodriguez is now with the Institut für Nachrichtentechnik, at the Universität Karlsruhe, in Germany.